One year ago the rower Matthias Schömann-Finck and his three sports colleagues out-beamed each other: World championship gold medal in the coxless four. The peak of an athlete’s career that came to an abrupt stop: The athlete from the RV Saarbrücken had to do without the season’s highlights this year – a severe disk herniation in the lowest intervertebral level was the reason. All conservative treatments failed, a rehabilitation program proved unsuccessful. This was true until two weeks ago. Now Schömann-Finck could resume slight training without pain; he owes this to Dr. Michael D. Schubert from the Munich APEX SPINE Center. Schubert is the expert for the most tissue-preserving disk surgeries worldwide. The method bears the difficult name „endoscopic minimally invasive nucleotomy“. It works like that: instead of an open intervention with a large wound a small incision for a working cannula of 7,5 millimeters will do. The prolapsed part of the disk will be removed with different minute instruments under endoscopic control. Anesthesia is just as small as the incision. 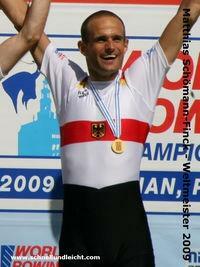 Rower Schömann-Finck could leave the recovery room already after two hours – on foot. He stayed in the hospital for one night and was completely symptom free the next day. After the world championship in New Zealand in November, which will still take place without him, the rower will resume his full training. The revolutionary therapy of the worldwide acknowledged spine surgeon Schubert saves Schömann-Finck - and all other patients treated with this tissue-preserving method – postoperative risks, complicated after-treatments, long hospital stays and missed work days. Altogether this leads to advantages also for the cost aspect – the total health care costs are several fold lower than with open surgeries.